Terry: I saw this in someone’s yard, and was wondering what it is? Doug: That’s a great plant. Beautyberry is kind of a one-trick pony, but what a trick. 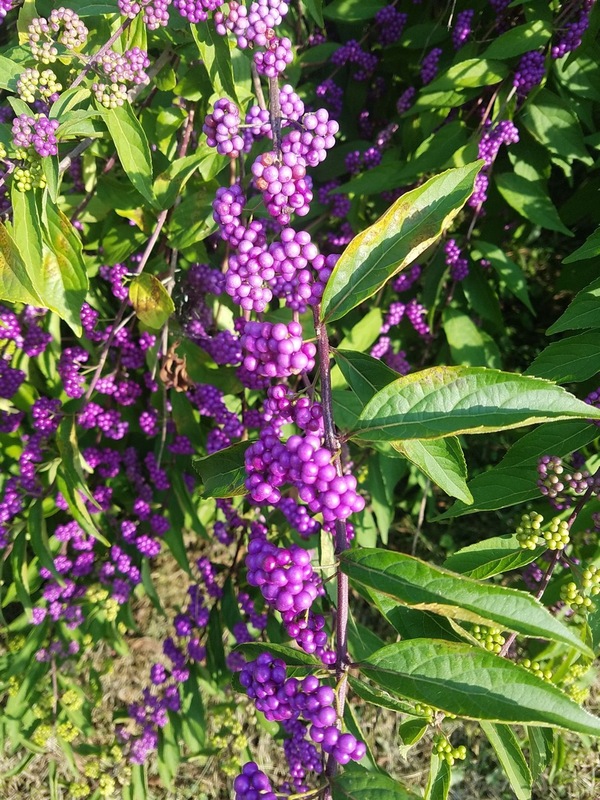 Those purple berries are stunning and are edible, although they are probably best left for the birds. They aren’t very tasty. It grows just about anywhere. In full sun, it’s columnar. There’s a big one in the Children’s Discovery Garden at Phipps Conservatory and Botanical Gardens. Mine grows in the shade, which gives it a weeping habit. You should grow one. Tom: A garden vendor is advertising nematodes for grub control in gardens. Are they something to consider? I have a really strong population of grubs and would like to treat. Or should I wait till the spring? Doug: Beneficial nematodes are a great way to deal with grubs organically. Beneficial nematodes are microscopic organisms. There are lots of different varieties and certain types will hunt out and kill grubs. It’s a leap of faith for gardeners, as they can’t be seen, but they work. And there’s still time to apply them, but the soil temperature must be 50 degrees or above. One of the advantages of nematodes is that they hunt out many different species of grubs, not just Japanese beetle grubs. Dave: I have two Big Boy tomato plants each in a container of approximate seven gallons. Does this look like a normal stalk? These little things can’t be easily removed by brushing for example. Fruit is plentiful but not very large and there is lots of end rot this year. I have been using Serenade regularly and blossom end rot preventative. Thoughts? 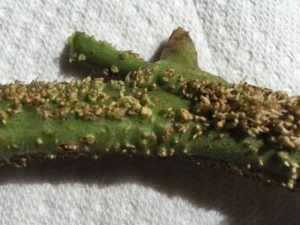 Doug: No worries about those little nubs; they are actually roots that start to form on the stems. If they can’t find soil, they will just harden up and turn green. Blossom end rot is very common in container-grown tomatoes. If the plant used all the moisture in the pot, then it can’t uptake calcium. The best way to prevent the problem is to keep the soil evenly moist, which can be a challenge in containers. I like the self-watering pots called Earth Boxes. Two full-sized plants will thrive in the container and watering isn’t as much of an issue. Kathy: I have an Annabelle Invincible hydrangea I need to move. I do cut this one down to the ground. Can I cut it down now and transplant it to a better spot? Doug: Yes, but just a note to other readers: Annabelle cultivars are the only hydrangeas we can cut to the ground. I love my Invincibelle Spirit hydrangea!